When Pleasant Gap Elementary School student Sami Nedrow grows up, she wants to be a meteorologist. After all, the soon-to-be fifth-grader said science and math are her favorite subjects, and tries her best to learn as much about them as possible. That’s why when she heard about Bellefonte Area School District’s STEM Camp at Pleasant Gap Elementary, she knew she had to sign up. “It’s just really fun and interesting, and I go to school here so know a lot of the other kids and teachers so it feels like home,” Sami said. “I’m not sure what’s my favorite yet, but I really liked learning about some mixtures and seeing what reacts with other (compounds), and mixtures that can turn a dull penny into a shiny one.” She was among about 80 students who participated in the first year of the camp from June 25-28 that aimed to promote STEM subjects – science, technology, engineering and math – in a fun and educational way. 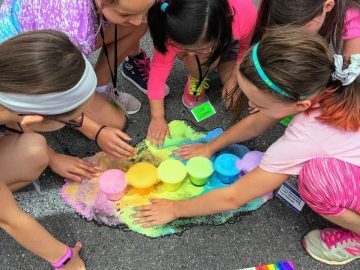 “The past couple years the district has been trying to promote science in the 21st century to help build skills students need when they leave here,” teacher and STEM Camp Coordinator Stacey Miller said. “It’s about trying to provide these opportunities for the kids.” Teachers have volunteered to teach and facilitate lessons and activities with help from three high school volunteers Abby Harper, Abby Lohr and Keeli Pighetti. The students, going into first- to sixth-grades, have been learning about plants and animals, chemistry and the science behind why a volcano erupts. They have also been making modeling clay like Play-Doh, bottle rockets and more.